Christine and Louie had a wonderful fun-filled reception celebration at the Ronald Regan Building in Washington, DC. Though their party wrapped up pretty late at night, we asked the newlyweds if they wanted to go to nearby US Capitol building for some romantic nighttime photographs. Their reply was, "Well, we are only getting married once -- we should do it right!" and off we were. 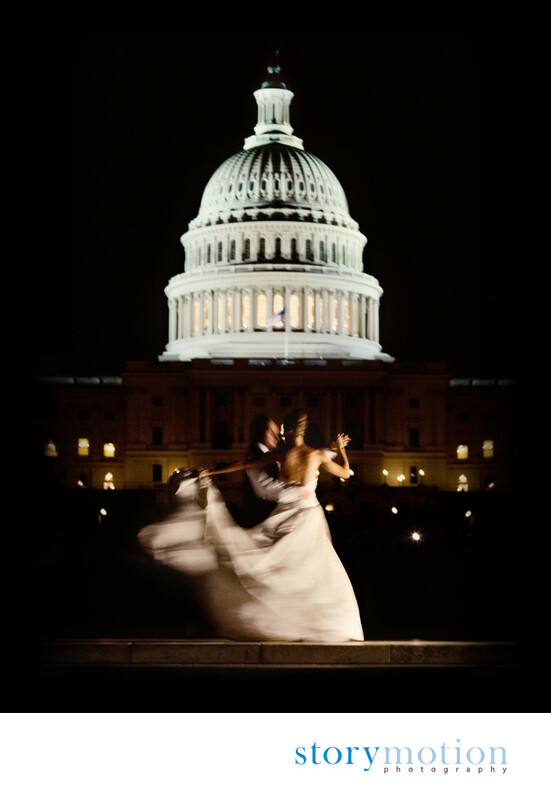 A twenty minute portrait session in near pitch darkness, with only the Captiol dome illuminated by projectors, and the couple lit by our lights, resulted in some very romantic photographs of the couple waltzing in front of one of the most recognizable DC landmarks. This image also quickly became one of our most recognized (and frequently requested) images.